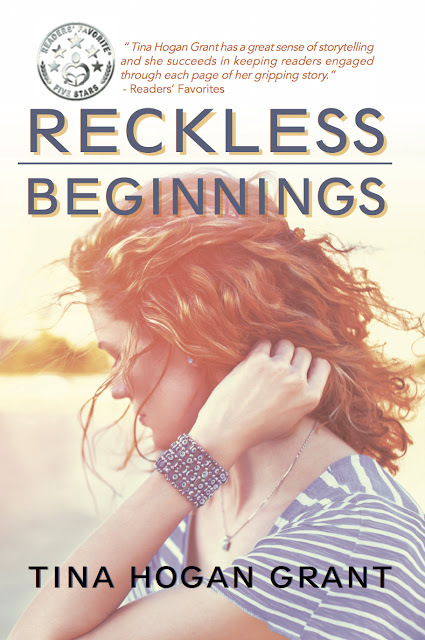 Welcome to the virtual book tour for Reckless Beginnings by Tina Hogan Grant! So many readers are also aspiring writers, and they want to know what some of the best practices are to achieve the same level as their favorite authors. Today, Tina is sharing with us some of her best advice for writers. There's also a sneak peek into her latest book and a giveaway. Please be sure to let her know what you think both here and at other stops along the tour! In order to improve your writing skills, you need to be adopting certain habits that over time become natural and a part of your everyday routine. Quoted from the Merriam-Webster Dictionary, “Habit – an acquired mode of behavior that has become nearly or completely involuntary.” Another way of saying this is: We do things from the force of habit. I can’t emphasize this enough. In order to be able to write you need to be reading. When you’re reading, slow down and take note of the writing style, the grammar, ask yourself questions – why do you like or not like the book? Is the book captivating? Were you drawn into the story right away? Does it have a good plot? Take note of the characters – are they descriptive enough – can you picture them? As a writer, read the book like a writer? Question the book like you would your own story. Learn from the bestsellers. Like anything in life that we want to excel in, we need to practice and keep at it. Kobe Bryant didn’t become a superstar basketball player overnight. It’s the same with writing. Write every day, doesn’t matter what you write, just write. Write in a journal, write a blog, add something to the current story you are writing. If you are stumped on what to write, use a writing prompt. When you have completed your story I encourage you to read it over and over and when you think you’re done, read it again and again. Trust me, you’ll be surprised at what you’ll find and how much you want to change. I suggest reading it out loud or use a text to voice software. When you’ve done all you can possibly do, it’s time to hand it over to others to read. I don’t recommend giving it to friends or family – they tend to be the worst critics, (afraid of hurting your feelings.) It’s best to give it to someone neutral. Listen to what they have to say and use the information. I also recommend, walking away from your work for a week or two. Write something else, focus on anything but the current story. When you return with a fresh mind, you’ll be amazed by how much more focused you’ll be and I can guarantee, additional changes will be made. Finally, have your work edited by a professional editor. There is nothing worse than reading a book that has constant spelling and grammar mistakes or simply doesn’t read well. Your reputation as a writer is out there for everyone to judge. An editor will be able to do the final polish and make it shine. As a writer, more than likely someone is going to criticize your work. We can’t please everyone. The first will hurt, but we can look at in a positive way and grow from it. Take note of the critique, learn from it and expand your knowledge. then tuck it away and move on. You’re doing something you love to do. You feel the passion to write. Embrace it, have fun with it. Get excited about your creation, the story, the plot, the ending. Don’t make it a dreaded chore – anticipate your next writing session and what you want to achieve. Set goals. Or from the author's website here. One randomly chosen winner via rafflecopter along the tour will win a $50 Amazon/BN.com gift card. A great post and great advice. Thank you’. It’s advice I was looking for when I began writing. Hope it helps others. You’re welcome. Glad you are enjoying the tour. Thank you for hosting. I will be available throughout the day to answer any questions. Congrats on the new book & good luck on the book tour!